Michael Haro, Manager of Environmental Resources; Lockheed Martin Corp.
Michael Haro is Manager of Environment, Safety & Health (ESH) at Lockheed Martin Aeronautics Co. in Palmdale, California. He has more than 32 years of experience creating sustainable, cost-effective ESH programs designed to reduce risks and add business value for TRW, General Dynamics, Allied-Signal and Lockheed Martin. Since January 2010, Mr. Haro has led Lockheed Martin's strategic directive to integrate ESH into the company's business life cycle for the Aeronautics Business Area. He is also leading the "Go Green" program to reduce carbon, water and waste-to-landfill footprint through a number of innovative source and energy reduction projects. From the company's 2007 baseline, waste-to-landfill, water use and carbon footprint have been reduced 39 percent, 19 percent and 5 percent, respectively. He also is the author of numerous publications on pollution prevention, hazardous waste management and air pollution control. 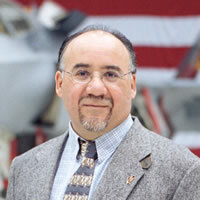 During his tenure at Lockheed Martin, Mr. Haro's environmental program has earned several awards, including two U.S. EPA Environmental Excellence Awards, the Governor's Environmental and Economic Leadership Award, and a U.S. EPA Performance Track Program Outreach Award. Mr. Haro has a Bachelor of Science in Environmental Sciences from the University of California, Riverside and a Master of Science degree in Environmental and Occupational Health from California State University Northridge.